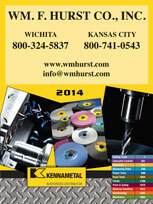 If you need high-performance carbide drills for your industrial operation in Kansas City, Wichita, Dallas, Fort Worth, or any other nearby city, turn to the company businesses in the Midwest have trusted for 50 years: Wm. F. Hurst Co. LLC. Our unmatched selection of industrial supplies includes a wide range of durable, reliable carbide drills. We also provide unrivaled customer support from a staff of professionals who have in-depth product knowledge and the ability to assess your operation and make recommendations that can help improve processes and reduce costs. We also offer a wide range of other carbide tools, such as carbide inserts and carbide end mills, as well as many other industrial supplies, including metalworking fluids, abrasives, safety supplies, and assembly tools. Additionally, Wm. F. Hurst Co. offers complete fastening systems for assembly lines, and can provide you with a more efficient way to manage your industrial tools inventory with complete integrated vending systems from CribMaster. Whether you need carbide drills, a tool tracking system, or anything else for your industrial operation in Kansas City, Wichita, Dallas, Fort Worth, Sedalia, Joplin, or any surrounding city in the Midwest, contact us today.